Dot plots can be used to display various types of information. 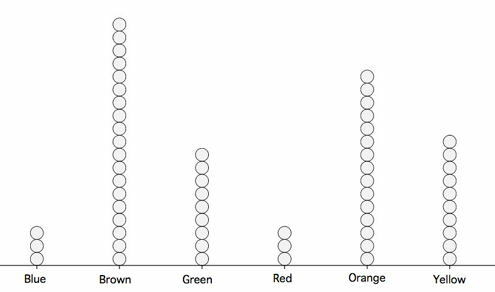 Figure 1 uses a dot plot to display the number of M & M's of each color found in a bag of M & M's. Each dot represents a single M & M. From the figure, you can see that there were 3 blue M & M's, 19 brown M & M's, etc. Figure 1. A dot plot showing the number of M & M's of various colors in a bag of M & M's. 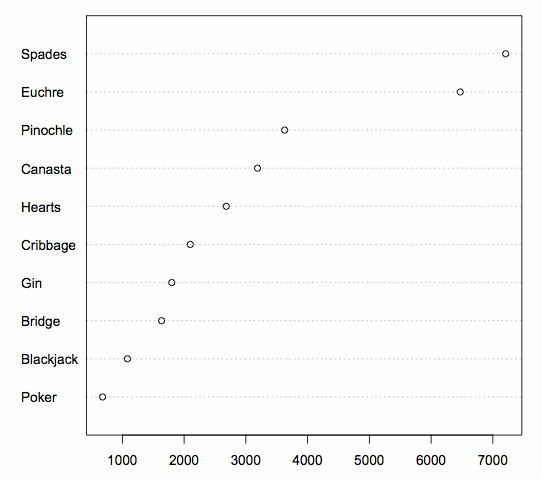 The dot plot in Figure 2 shows the number of people playing various card games on the Yahoo website on a Wednesday. Unlike Figure 1, the location rather than the number of dots represents the frequency. Figure 2. A dot plot showing the number of people playing various card games on a Wednesday. The dot plot in Figure 3 shows the number of people playing on a Sunday and on a Wednesday. This graph makes it easy to compare the popularity of the games separately for the two days, but does not make it easy to compare the popularity of a given game on the two days. Figure 3. 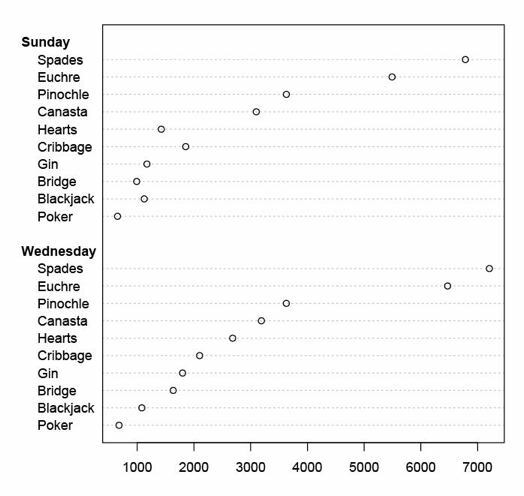 A dot plot showing the number of people playing various card games on a Sunday and on a Wednesday. Figure 4. An alternate way of showing the number of people playing various card games on a Sunday and on a Wednesday. 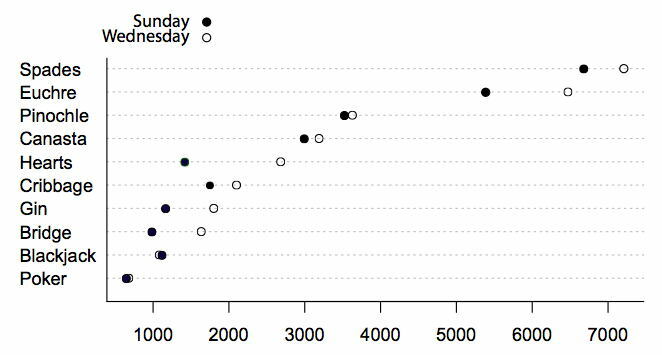 The dot plot in Figure 4 makes it easy to compare the days of the week for specific games while still portraying differences among games.